Crostini with radicchio salad and local salumi from Osteria Dai Zemei. 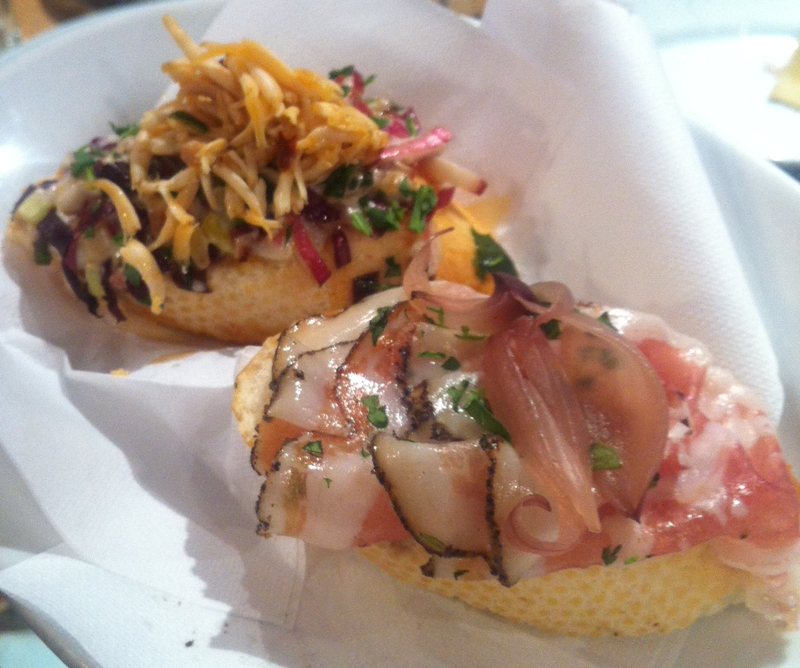 Cicchetti – translated as “snacks”, “hors d'oeuvres” and Venetian “tapas” - are the famous gourmet finger foods of Venice. Well-known cicchetti include deep fried zucchini flowers, grilled and steamed octopus, bacala mantecato, and all kinds of crostini. “Crostini” are slices of bread toped with local ingredients such as Veneto meats, cheeses and vegetables. However, the term cicchetti has come to encompass just about any local food served in small portions in Venice. You can even get the famous Venetian squid in ink sauce as “cicchetti” in some osterias. Served in small portions, cicchetti are usually enjoyed with wine or spritz in the afternoon and evening hours. A plateful of cicchetti can also make an excellent, authentic, and affordable Venetian lunch. Cicchetti are displayed in glass cases above and surrounding the bar in many Venetian bars and osterias, and are usually eaten while standing at or near the bar. The small bars and restaurants listed here are a few of the best, local-favorite, places to begin sampling real Venetian cicchetti of different styles. Start here, and then branch out! Almost all of the bars and restaurants in OG Venice Travel Guide offer their own authentic and unique cicchetti. Much more than a regular bar! 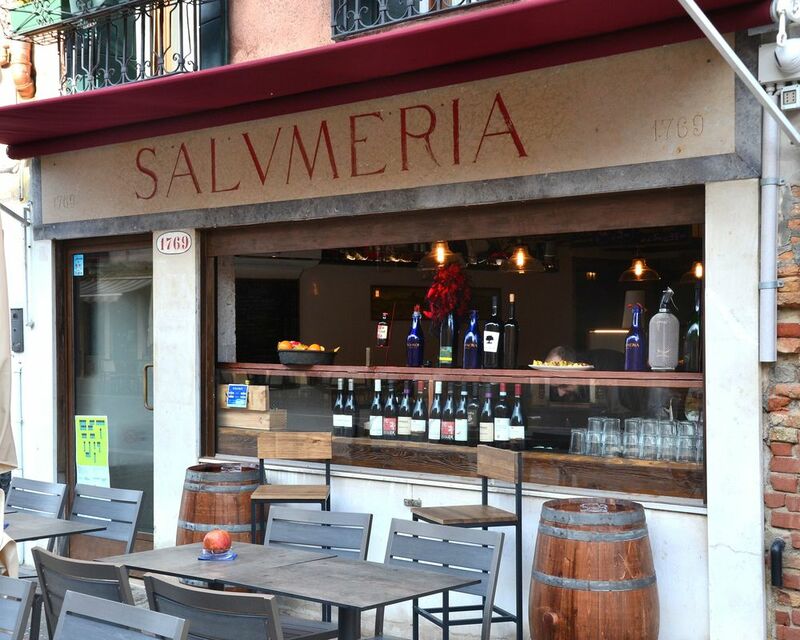 The owners, chefs and staff at Salumaria are passionate and creative in both their cooking and preparation of the snacks and cicchetti they offer. Try the "house Bacala" and the "Carbonara" mini quiche! If you open your mouth to ask a question about the food, they will respond by enthusiastically sharing ideas and inspiration while also likely presenting more plates of food which they have magically prepared in their small open kitchen all while attending the conversation. You can choose to graze on cicchetti, or easily make a meal by asking for a plate of combined fish, meat or veg dishes. Osteria da Carla, San Marco 1535 near Frezzeria. 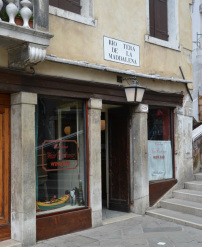 Tucked away in a tiny corner all its own just off of the Frezzeria between Piazza San Marco, the Teatro La Fenice and Calle XXII Marzo, Osteria da Carla is the kind of sweet little treasure you would only find if you were fortunate enough to be looking the right way as you walked. From the outside it looks like a classic warm osteria. Inside is a cicchetti selection more unique than any I can remember seeing. Though a snack here is not cheap by "cicchetti" standards, it was more than reasonable for the quality of the food. Bar Cantinone Gia Schiavi, Dorsoduro 992 on Fondamenta Nani, Near Zatere. One of those Venetian treasures that is almost too easy to walk right past -it looks like, and is, a wine shop- Il Cantinone also serves up some of the best, freshest and most surprising crostini in Venice. Some small-bites to die for there might include creamed squash with flower petals, truffle cream, and goat cheese with pepper jam. Go there in the early afternoon and put your lunch budget to good use with a big plate of 1 euro crostini and a couple glasses of regional wine! Osteria Dai Zemei, San Polo 1045 on Ruga Rialto. 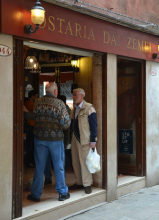 Dai Zemei (The Twins) is a small no-frills, centrally located ostaria only minutes walk from the Rialto market. What makes it special is its great selection of regional wines and huge selection of crostini so fresh that you will probably see it made before your eyes. It's a regular snack-stop for me and I always hope to get there in time to get my two favorites: radicchio salsa and peppered pancetta. Yes, they sell out fast! But if you go in the late morning or early evening you can catch it at a moment when the counter has just been stocked. 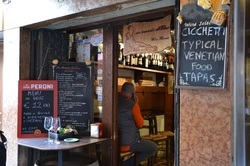 Cantina Vecia Carbonera, Cannareggio 2329, on the Strada Nova directly across from Campo Maddalena. A famous old place, with a twist. Cicchetti-wise we love them for their amazing frittura! If you only eat one fried zucchini flower during your stay in Venice, eat it here. Then stay, because this Cantina is an oasis of authentic local flavor with reasonable prices, friendly service and good wines. All of that in one place is very hard to come bye in this area of Venice now-a-days. Un Mondo Di Vino, Cannaregio 5984A, on Salizzada San Canzian. Since the rise in popularity of this place, Salizzada San Canzian has become a hot spot for cicchetti bars. There is a new one right across the street! Nevertheless, Un Mondo Di Vino (A World of Wine) is still one of the best places to head to if you plan to make a meal of cicchetti. No simple, or fancy, crostini here! Instead you'll find all kinds of steamed and sautéed seafood, polpetti and fresh and cooked vegetables. Standing-room only at lunch time, but well worth the wait! Osteria Al Portego, Castello 6014, On Calle Malvasia, Near Campo San Leo. Very lively at aperitivo time, Al Portego is just about as authentically Venetian as it gets. And they take a very a broad view of Cicchetti. Here it includes fried-stuffed olives, wings and veggies, but also small portions of typical Venetian dishes such as seppie in nero all a Veneziana (squid in ink sauce). A small down to earth place, it's one of the most authentic eateries in Venezia. Go for a snack. Get a table. Stay for the fegato alla Veneziana (Venetian liver and onions).